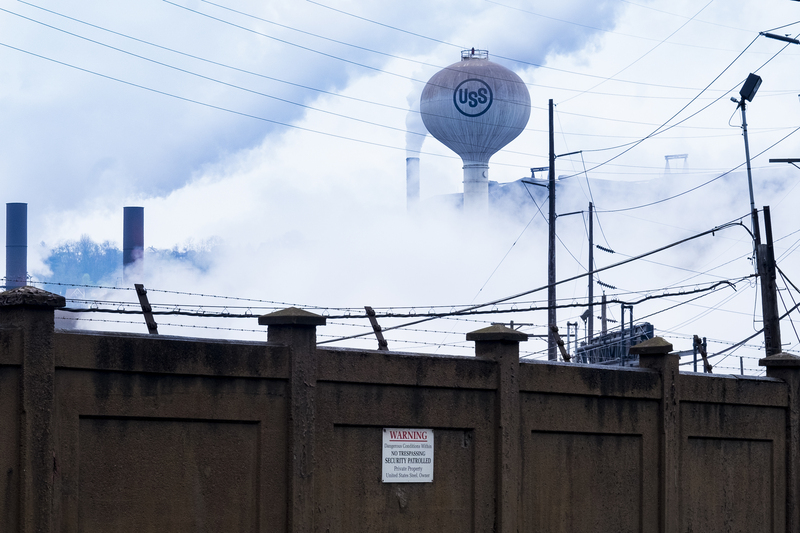 Of all of the old steel towns around Pittsburgh, Pa., Braddock can easily make the claim as the steel industry’s ground zero. It is where the steelmaking industry in Western Pennsylvania was born and 30 years after its collapse, it stands as a monument to the resulting depression and decay. Located in the eastern suburbs of Pittsburgh on the Monongahela River, the borough is named for Revolutionary War General Edward Braddock. In 1873, Andrew Carnegie built the Edgar Thomson Steel Works in what is now North Braddock. The plant was Carnegie’s first steel mill. Named after J. Edgar Thomson, who was president of the Pennsylvania Railroad, it was one of the first American steel mills to use the Bessemer process. It remains in operation today, albeit running at a reduced capacity, as a part of the U.S. Steel Corporation’s Mon (Monongahela) Valley Works. Carnegie, also a philanthropist, opened the first of his 1,689 libraries in the United States in Braddock in 1889. It was the second Carnegie Library in the United States to be commissioned and was the first of only four libraries that he fully endowed. In 1893, an addition doubled the size of the building and included the third Carnegie Music Hall in the United States. Braddock followed the same fate of the other mill towns with the collapse of the steel industry in the 1970s and 1980s, with businesses collapsing and unemployment rampant. Coinciding with the crack cocaine epidemic of the early 1980s, the combination nearly destroyed the community. In 1988, Braddock was designated a financially distressed municipality under Pennsylvania’s Act 47. Although Braddock still languishes in Act 47 almost 30 years later, the borough of North Braddock, which didn’t enter Act 47 until 1995, was able to pull out of the program in 2003. Once a bustling town with dozens of churches, schools, theaters, furniture stores, restaurants and breweries all squeezed into less than one square mile, today the town struggles with 30% unemployment, home prices around $5,000, and a median household income of $17,000. Ninety percent of the businesses and homes are abandoned or demolished and the population hovers around 2,000 – down from 20,000 in the 70’s. But in all this poverty and decay, there are people fighting to bring Braddock back from the dead. For the last 11 years, Mayor John Fetterman and his wife Gisele, have worked tirelessly to rebuild the town. An alumni of Big Brothers and Big Sisters and AmeriCorps, Fetterman, who has a graduate degree in public policy from Harvard’s Kennedy School of Government earns $150 a month as Braddock’s mayor, but does not take the money for himself and instead, directs it to community needs. Fetterman has been known to purchase abandoned homes for people in need and once bought a two-bedroom house for $15,000 and then sold it to a resident for $1. Gisele Fetterman carries her son August outside of the Free Store in Braddock, Pa. 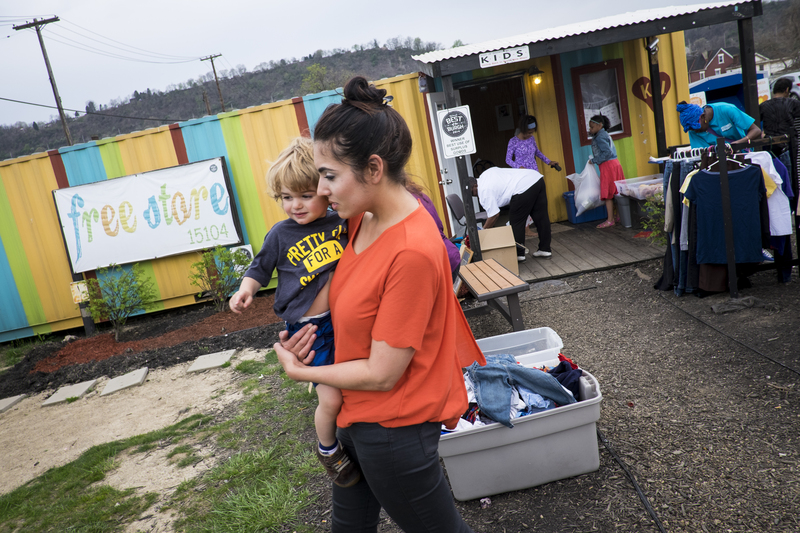 Opened in 2012 by Gisele Fetterman, wife of Braddock Mayor John Fetterman, and housed in a shipping container on donated property, the store collects overstock supplies such as clothing and food and provides them to needy people in the community free of charge. The rules of the store are simple: Be kind. Take only what you need, and pay it forward. The Free Store, the passion of Fetterman’s wife Gisele, is a no-charge thrift store run out of shipping containers off Braddock main thoroughfare. Opened in 2012 and partnered with organizations such as Heritage Community Initiatives and a New York City-based organization called Kids in Distressed Situations (KIDS), the store collects overstock supplies such as clothing and food and provides them to needy people in the community free of charge. The rules of the store are simple: Be kind. Take only what you need, and pay it forward. Mayor John, as he likes to be called, started a nonprofit organization called Braddock Redux, financed until recently primarily by family money and bought a vacant church in 2003 with the intention of renovating it for community use. The Nyia Page Braddock Community Center is named for Nyia Page, a 23-month-old Rankin girl who died of exposure and hypothermia in 2007 after being outside in single-digit temperatures for more than a day. Her father, William Page, was found guilty of first-degree murder and aggravated indecent assault. Fetterman also began the Braddock Youth Project (BYP) which is a youth work training program that seeks to foster skills that will aid youth in advancing toward positive life outcomes. Since its inception in 2006, one of the projects undertaken by BYP youth is planting and maintaining gardens at three locations in Braddock. All three sites were converted, by BYP youth, from vacant lots. Larry Jones, 62, waves as the passing truck drivers from outside of Al’s Market as they arrive in Braddock, Pa. for a load of slag from the Edgar Thompson Steel Works. Al’s is a morning gathering spot for locals going to work and for steel workers on their way home. Very few of the workers at the Braddock mill actually live in the city. Jones is an employee of Carey Pittsburgh, a limousine service across the street from the market. Braddock was once a a bustling town with dozens of churches, schools, theaters, furniture stores, restaurants and breweries. The population hovers around 2,000, down from 20,000 in the 70's, all squeezed into less than one square mile. The town struggles with 30% unemployment, home prices around $5,000, and a median household income of $17,000. Old friends, "Greeda" Carrington, 63, and Fred Smith, 72, have a a beer as they reminisce about the good old days in the the early morning hours at Lucky Frank's Irish Pub in Braddock. Carrington and Smith were born and raised in Braddock but Smith moved to the North Side of Pittsburgh in 1982 due to the violence and drug problems that were beginning to plague the city. Carrington still lives there. Signs created by Gisele Fetterman, wife of mayor John Fetterman, line the main thoroughfare of Braddock Ave. Braddock was once a a bustling town with dozens of churches, schools, theaters, furniture stores, restaurants and breweries. The population hovers around 2,000, down from 20,000 in the 70's, all squeezed into less than one square mile. The town struggles with 30% unemployment, home prices around $5,000, and a median household income of $17,000. A woman carries food from the Free Store in Braddock, Pa. Opened in 2012 by Gisele Fetterman, wife of Braddock Mayor John Fetterman, and housed in a shipping container on donated property, the store collects overstock supplies such as clothing and food, and provides them to needy people in the community free of charge. Partnering with organizations such as Heritage Community Initiatives and a New York City-based organization called Kids in Distressed Situations (KIDS) helps to fill the store with clothing for men, women, teenagers, children and babies, and other essentials such as towels, diapers and formula which are then given away to anyone who needs them. The rules of the store are simple: Be kind. Take only what you need, and pay it forward. A young girl selects a bike at the Red Lantern Bike Shop in Braddock, Pa. Brian Sink opened the Red Lantern Bike Shop opened in 2012 with the idea to provide bike repairs and free bikes for residents of Braddock. But after it became popular they lifted the restrictions on residence. Sink said he gave away about 1,100 bikes last year. Sink, known around town as "The Bike Guy," fixes donated bicycles and gives them away for free at his shop that is housed in a shipping container and part of Gisle Fetterman's Free Store. The Free Store, receives surplus and donated clothing, school supplies, food and toys that are redistributed to people in need. A customer enters Bell's Market in Braddock, Pa. After almost 50 years the tiny shop purchased by Louis Greenwald is still is open for business. It is just one of a handful of businesses still operating in Braddock. The store which began as a dirt floor store in the 1890s, is the town's only full-service grocery. Braddock boys play basketball on one of two outdoor courts next to the community center built by Mayor John Fetterman since being elected mayor. The artwork on the building is also an initiative of Fetterman. His intention is for a pursuit of public art and he has implemented programs to attract artists to the area to live, work and inviting them decorate many of the old buildings. “Ball Don’t Lie” comes from an expression in professional basketball attributed to Rasheed Wallace of the NY Knicks. If a player gets free throws for a questionable foul and then misses the shots, the Ball don't lie. The ball itself has judged the foul as bogus. A mural of Jesus peers out from behind a security gate at the New Guild Art and Design Studios in Braddock, Pa. David and Suzann Miriello along with David and Mary Korns opened the New Guild Art and Design Studio in 1991. Braddock's mayor, John Fetterman, has spearheaded the effort to lure young entrepreneurs and artists to Braddock through a network of community projects and investment opportunities, supporting public art projects, recycling derelict buildings and encouraging creative ideas to revitalize a crumbling town. The Western Pennsylvania branch of the Police Athletic League runs a boxing program in the basement of the Braddock Community Center, which used to be a church. The program is free to everyone between the ages 8 and 18 and anyone currently attending high school. Its goal is to create relationships between volunteers and local kids, to help steer them away from crime, violence and drugs and be surrounded by positive influences. With a population of just over 2,000 (down from a high of 20,879 at the height of the steel industry, Braddock is almost a ghost town even though it is the home of the last steel mill still in operation in the Monongahela River valley. The Edgar Thompson Steel Works, built in 1872, was the first major steel mill built in the United States. Braddock was originally built to house the mills workers, but none of the mills nine hundred or so employees live there. Parishioners attend Sunday Service at Saints Peter and Paul Byzantine Catholic Church in Braddock, Pa.
Reverend John J. Cuccaro blesses the church at the beginning of Sunday service at Saints Peter and Paul Byzantine Catholic Church in Braddock, Pa.
Local businessman John Sciarretti has morning coffee with a police officer in Al's Market in Braddock. Pa. Al’s is a morning gathering spot for locals going to work and for steel workers on their way home. Very few of the workers at the Braddock mill actually live in the city. Braddock Gardens, a community garden sponsored by Grow Pittsburgh, sits against the backdrop of the Edgar Thomson Works in Braddock, Pa. The mission of Grow Pittsburgh is to teach people how to grow food and promote the benefits gardens bring to neighborhoods. Braddock Farms grows and sells a wide variety of vegetables and herbs to the local community. The steel plant was Andrew Carnegie's first steel mill and was named after J. Edgar Thomson, who was the president of the Pennsylvania Railroad. Active since 1872, the mill is currently owned by U.S. Steel and is part of the Mon Valley Works. A truck loaded with slag drives through town from the Edgar Thomson Works in Braddock, Pa. Active since 1872, the mill is currently owned by U.S. Steel and is part of the Mon Valley Works. The plant was Andrew Carnegie's first steel mill and was named after J. Edgar Thomson, who was the president of the Pennsylvania Railroad. Slag is a by-product of the steel making process. View of the Edgar Thomson Works in Braddock, Pa. Active since 1872, the mill is currently owned by U.S. Steel and is part of the Mon Valley Works. The plant was Andrew Carnegie's first steel mill and was named after J. Edgar Thomson, who was the president of the Pennsylvania Railroad. Braddock was once a a bustling town with dozens of churches, schools, theaters, furniture stores, restaurants and breweries. The population hovers around 2,000, down from 20,000 in the 70's, all squeezed into less than one square mile. The town struggles with 30% unemployment, home prices around $5,000, and a median household income of $17,000. The marching band from nearby Woodland Hills High School passes in front of spectators near the former Braddock News building during the annual Community Day parade in Braddock. Braddock High School closed in 1970. A man walks along the main street in Braddock Pa. I am glad to see Braddock making a come back. Thanks for sharing! I am writing, because I was born in Braddock, PA, on November 23, 1946. I am African-American. I was raised in Braddock and graduated from Pitt in 1968 and Dickinson School of Law, in Carlisle, PA in 1972. I know this story personally. Growing up in Braddock, I saw only dead end jobs for me and decided an education was my way out. Anyone, who grew up in Pgh and also Pennsylvania, could see the decline of the manufacturing age, beginning in the 1960s. The city fathers were in the grip of the steel industry and did nothing to diversify their tax base. The monopolization by one industry to the exclusion of any other job creation results in the kind of devastation we see today. The jobs will never come back in manufacturing. I am a committed trade unionist and believe unions are the savior of the middle and working class. We need to be talking, talking, talking about education and retraining people with higher technology skills. The bitterness of these residents is misplaced. Their local elected officials and congressional representatives need to begin talking the hard truths. Hope and the future is in bringing new businesses, maybe wooing the information technology, health, and financial industry. I know this is not easy, but they must start somewhere. The old steel manufacturing and coal industry will not return to its former state. I wonder, with all your talent, that you did not consider the town of Hazelwood in the stories. I lived there as a child and later, as I attended Duquesne University. My grandmother had a beauty shop, Helen’s at 5426 Second AVenue and I attended St. Stephen’s church and school. Now her block is completed effaced. No buildings remain. Hi Carol. I am planning on doing some work in Hazelwood. So much yet to do in this project. I still need to explore the towns along the Allegheny. If you have any suggestions of places to go in Hazelwood where the old timers hang out, places to find examples of ethnic traditions being preserved and/or any remnants of the steel industry, please let me know! Thanks for looking.